Good point! Whilst you probably know (or could guess!) it means that workers getting paid a fair price for the goods that they produce, there’s actually a bit more to it than that. Fair Trade is all about better prices, yes, but it’s also about decent working conditions, local sustainability, and fair terms of trade for farmers and workers in the developing world. The movement came about after people recognized that conventional trade wasn’t providing fair wages and sustainable livelihoods for the world’s poorest people. Poverty and hardship make these workers more vulnerable to exploitation by limiting their choices, access to markets and negotiating power. The idea with Fair Trade is that farmers or workers are paid a higher price for their goods or services, and this cost is passed onto the consumer, who will pay more for a product that has been fairly traded. There’s no one definition of Fair Trade; there are many different organisations who promote Fair Trade, and they have different standards and criteria. The 10 principles listed by the World Fair Trade Organisation (WFTO), which Fair Trade organisations are expected to follow, are excellent for explaining what Fair Trade companies across the globe strive to achieve. Fair Trade has existed since WWII, but was more focused on handicrafts in the beginning, with products sold solely from Fair Trade shops (also called worldshops) and churches. From the 1980s there was a shift towards the fair trade of agricultural products, and the idea of certification came about. Certification was introduced in 1988; the first certified Fair Trade product was coffee.The idea behind certification was that it allowed consumers to recognize which products gave farmers a premium price for their crops and followed Fair Trade principles. This meant products could be sold in mainstream shops such as supermarkets rather than specific Fair Trade shops. Certification has allowed the reach of Fair Trade to grow massively, and more customers means more farmers can benefit. How does certification work? An independent organisation certifies that the commodities used in a product meet Fair Trade standards, and manufacturers pay for the right to use a logo. This tells consumers that the product meets certification standards for Fair Trade. The FAIRTRADE Mark is probably the most famous Fair Trade logo: it’s currently used in over 50 countries and is attached to over 27,000 products. It’s an independent certification mark that guarantees a product has been produced according to international Fair Trade standards. It shows that the product has been certified to offer a better deal to the farmers and workers involved. Certification schemes with logos that people recognize mean that products can be stocked in supermarkets where high volumes of products can be sold. It is estimated 90% of consumers trust the FAIRTRADE Mark – and this confidence means higher sales. Whilst the FAIRTRADE Mark is the world’s biggest Fair Trade certification scheme, it’s not the only one. Different certifiers will have different standards and procedures, but all promote Fair Trade. Not all Fairly Traded products are certified, either. Remember that participating in a Fair Trade certification scheme costs money. Some organisations that work with small cooperatives to produce Fair Trade products may not have the resources to certify their products; but that does not mean they don’t adhere to Fair Trade principles. Most businesses selling Fair Trade products want to be as transparent as possible, so if in doubt, just ask questions. What Can We Do to Support Fair Trade? Buy Fair Trade products! Simple as that! The most common products are coffee, chocolate, sugar and bananas, and you’ll be able to find these in supermarkets. Health food stores and independent grocers will probably have a wider range. Start with just one product that you buy that has a Fair Trade alternative, and make the switch. Last year I switched to only buying Fair Trade chocolate. The market for Fair Trade products continues to grow every year, and the more we support it, the more this growth will continue. Do you already buy Fair Trade products? 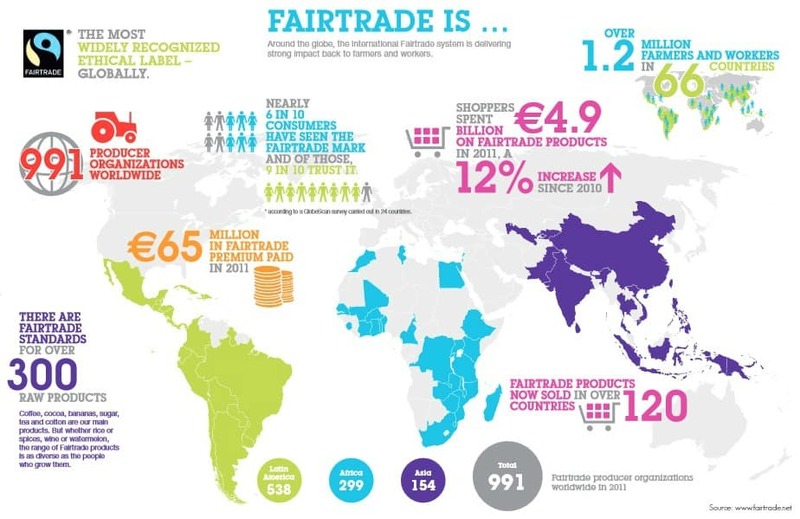 Are you new to Fair Trade but willing to make the switch? I’d love to hear your thoughts so please leave a comment below! 3 Comments • Leave a comment! I.e. Fair Trade is fair once you have the money to get accreditation, but until then, it is not as fair as one would like, for those small businesses who want to make their way into the international market.